Last year I went on a shopping spree for heirloom beans! They seemed to be all the rage, popping up in magazines and online. I couldn’t resist buying them. I bought at least 6 different varieties of heirloom beans (by Rancho Gordo) and never did anything with them. So much for trying them right? Just looking at my overflowing pantry, I decided their time has come. I needed to use them up! I think there are a few reasons it has taken me so long to use them. The first is that I wasn’t as interested in plant-based food as I am now. Another is that there aren’t very many recipes out there that call for these. I think part of the reason for the lack of recipes, is that they are supposed to taste good enough to eat on their own. Or at least with minimal additions. And as good as they may be, I’m just not into eating plain beans. So, after some digging around, I ended up making bean soup with wine! I cook with wine every now and then, but this is the first time I’ve used it to make beans. The heirloom beans I used in this soup are called cranberry beans. These beans turned out to be pretty tasty. They have a unique flavor and the texture is very soft and creamy. 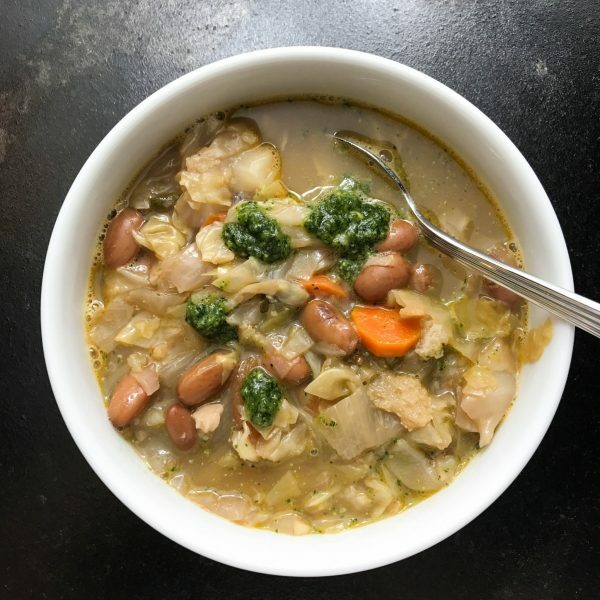 While the beans make this soup unique, I think the real star, is this kale pesto. 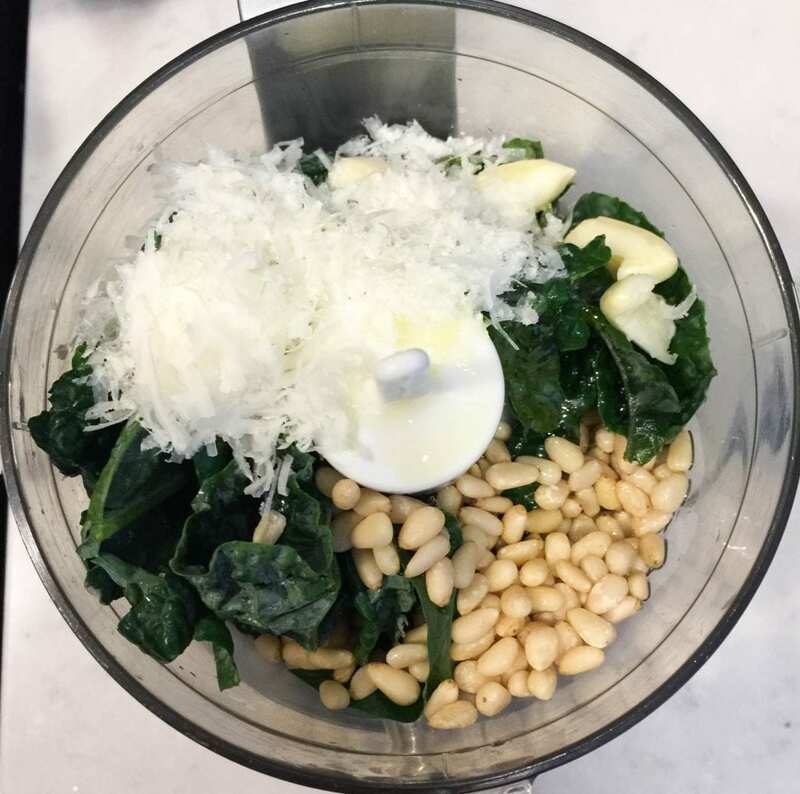 You make it with pecorino cheese, lacinato kale, garlic, and pine nuts. The end product of that mixture stands as a sharp contrast to the rest of the dish. 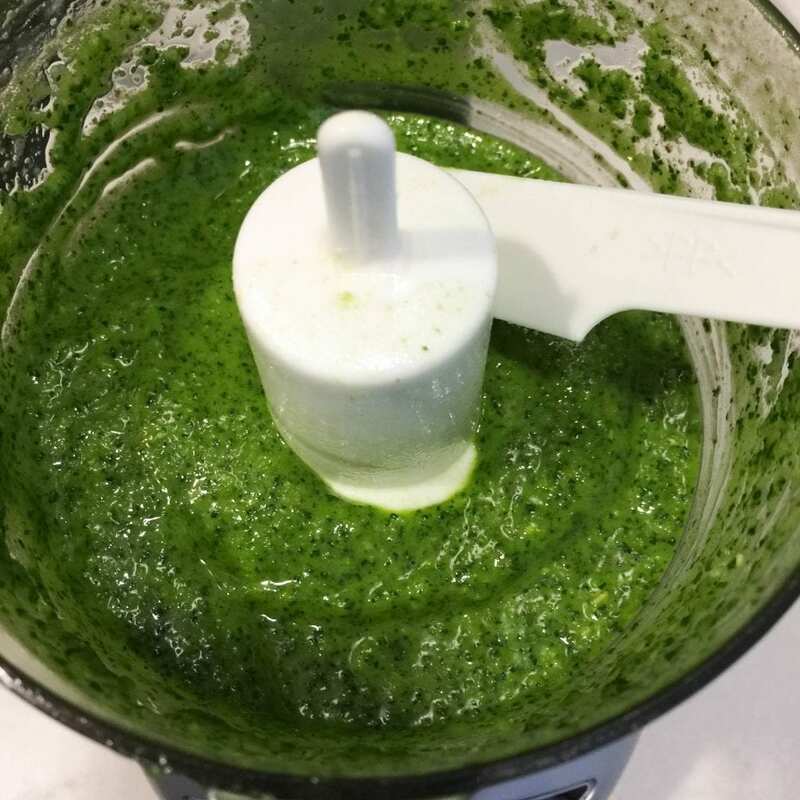 The soup flavors are rather delicate and this pesto rounds it out quite nicely. If one of your goals this year is to eat healthier, this could be a good option to consider. It’s got plenty of beans and vegetables and tastes very clean and hearty. While it won’t take you to the moon, it might very well fill you up. One happy spoonful at a time. Using a medium pot, cover beans with cold water and soak overnight. The next day, use the same pot and bring the beans and water to a boil. Then reduce to a simmer and cook covered until tender, ~2 hours. Add salt and remove from the heat. To make the soup, heat a large pot over high heat. Add the olive oil and pancetta and cook until the pancetta is crispy. Once crispy, remove and place on a paper towel-lined dish. Quickly add the onion, carrot and celery. Cook for 3-4 minutes. Then add the garlic, parsley and cabbage and cook for 3 minutes. Stirring occasionally. 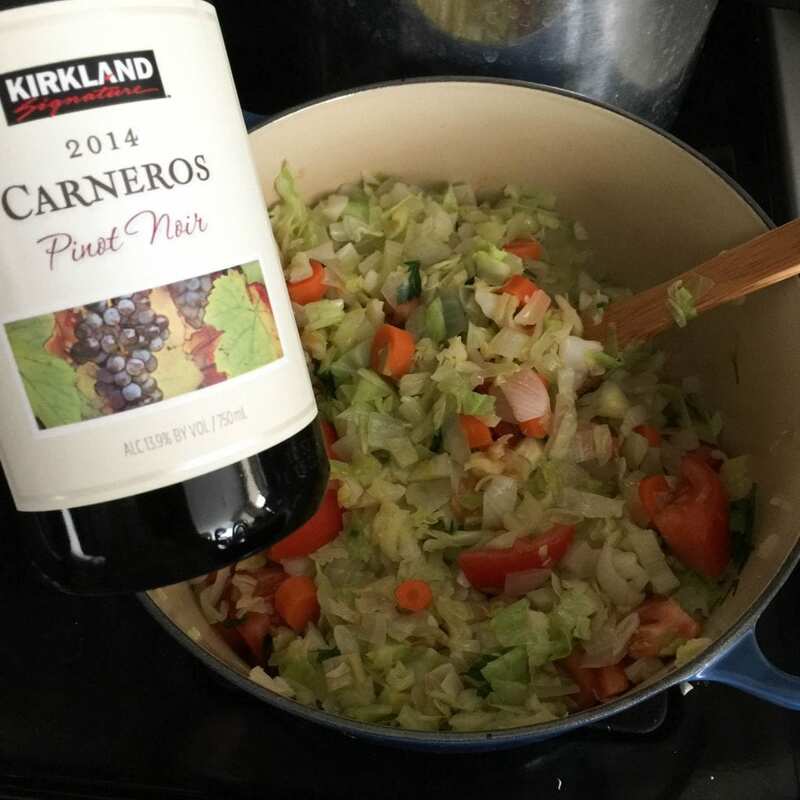 After cabbage appears softened, add the tomatoes and red wine. Cook for 3-4 minutes or until the alcohol smell has dissipated. Add the beans and their broth, chicken stock, and bay leaf and simmer for 15 minutes. While the soup is simmering, tear the bread up into large pieces. Brush with the olive oil and toast in the oven for 10 minutes until lightly brown and crisp. Stir the bread into the soup and continue simmer for another 10 minutes. You can try to break up some of the bread pieces to thicken the soup. Add salt/pepper to taste. Remove the central rib from each leaf of kale. Roughly chop and place in the work bowl of a food processor with the garlic, pine nuts, olive oil and cheese. Season with salt (optional) and process until smooth. Serve soup in a warm bowl with a spoonful of pesto in the center. If you can't find Rancho Gordo in your local market, Amazon has a sampler available. thank you for linking back to my post MJ! I always prefer to cook my own beans but did want to try the heritage ones. I’m on a search, thanks to your delicious recipe, to find cranberry beans! Whole foods usually has a good selection otherwise amazon or direct from the farms too! Thanks! Ordered and looking forward to eating them! That sounds delicious. Can you buy heirloom beans at a regular store ? i think it depends how well stocked they are. two of the larger suppliers i know of are ranchogordo.com and http://www.zursunbeans.com. I also did a search on amazon and they have them too!